It's not often I find myself in a position to help someone else. It takes almost all of my effort and sanity to keep my family going, and sometimes, even that's not enough. We are very fortunate to have what we have. Some weeks are worse than others but like everyone, we manage the best way we know how. For a long time I have been a dedicated reader over at Praying For Parker. I cannot recall how I came about his site, but I did and enjoyed reading about him so much I continued to return often. Parker is a remarkable little boy who has overcome more obstacles in his 3 years than most children would endure in a lifetime. His blond hair and brown eyes pop out in photos and you immediately fall in love. I've never met Parker, or his family, but as many of you know, a growing number of us parent-bloggers have a way of uniting with one another into one heck of an online family. It doesn't matter who we've met face to face or spoken to over a telephone. Our online family is kept together by allowing each other a glimpse into our homes, our lives, our triumphs and our troubles. Support comes in the form of comments and emails, photos and instant messaging. All just as important as a hug, a hand-shake and a kiss. Take a moment to go over and read a little bit about Parker. He is about to begin another phase of surgeries and recovery. Those two words alone are hard to comprehend when we are talking about a 3 year old little boy who's already been through a lot of surgery and recovery time. As you can imagine, medical bills are piling up and trips back and forth to the hospital are becoming so expensive with the cost of gas on the rise. Parker's family needs a little monetary lift, as most of us do at one time or another. Click here to get somewhat of an overview of Parker's conditions. As part of a Pay-It-Forward, Random Act Of Kindness, I am holding a small fundraiser for Parker. It's something I feel good about doing and it allows me to give a little something to someone else. 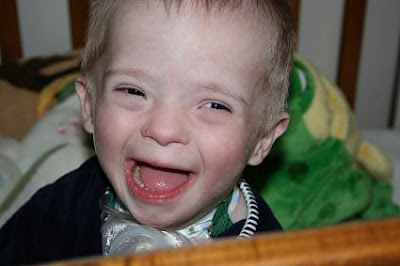 The fundraiser, Pictures For Parker, is officially underway. Here's what I am offering. My daughter Izabel, age 2, loves to color and draw. She has a writing utensil in hand most of the day. I have numerous pages of scribbles and lines, circles and dots filling folders. She is my inspiration for this fundraiser and therefore will be the artist. I want her beautiful pictures to radiate a smile across Parker's face. 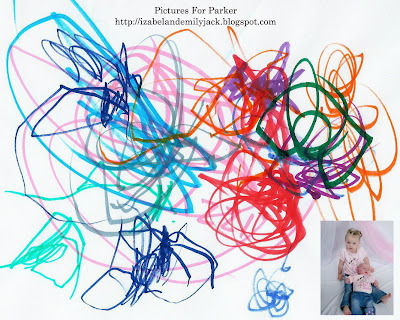 Let Izabel draw/color a picture in your name for a $1.00 donation to Parker's Medical Fund. I myself know that sometimes even a dollar is hard to come by, but maybe you have some loose change sitting around that you could use. Izabel's pictures will be well worth your pennies, nickels and dimes. What we will be doing is creating a unique masterpiece in your name and then bind them together to make a colorful book to send to Parker for him to look at. Each page will be an Izzy original and will contain a picture of you (if you'd like) and your web address. A $1.00 donation (Cash/Check/Money Orders) will get you a wonderfully created masterpiece designed in your name and all proceeds will be sent to Parker. This fundraiser will go through Wednesday, May 14th, 2008. If you would prefer to use a Credit/Debit Card, go here to donate directly to Parker's Medical Fund. If you use this method, please let me know so that we can add you to the book. Count Us In! There is also a link on my web page as well. Thank you so much! What an amazing idea! I will be blogging this and, of course, requesting my own original artwork. Thank you for doing this. Parker and family are so dear to my heart. Is there more I can do to help? We've done a fund raiser for Parker at my place before. Hi There - Count us in on this wonderful fund-raiser! I just sent a donation to Tammy through the donation button on her website we would love to be included in your lovely book! We all adore Parker here and I've been working for the past month on a fund-raiser post for both Parker and Rhett that is going up today, and I'm linking your site. I just love your little girl's pictures and this is such a beautiful thing to do!